The stars of the Pleiades sit amid a dusty sky in Taurus. 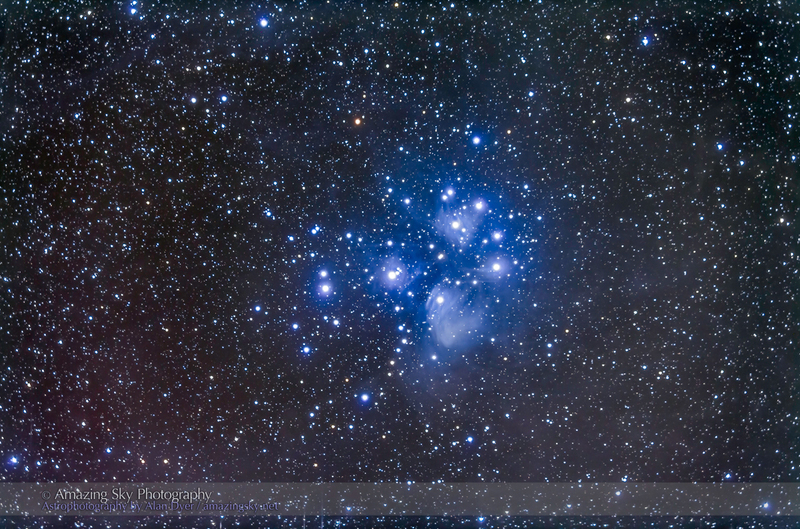 These are the famous Seven Sisters of Greek legend, known as the Pleiades. They are the daughters of Atlas and Pleione, who are also represented by stars in the cluster. Many cultures around the world tell stories about these stars, but in Greek tradition their appearance signalled the summer sailing season in the Mediterranean. The Pleiades first appear at sunset in the eastern evening sky in autumn and put in their last appearance in the western sky in spring. One story has it they were placed in the sky to recognize their devotion to their father Atlas and his unending labour in holding up the heavens. 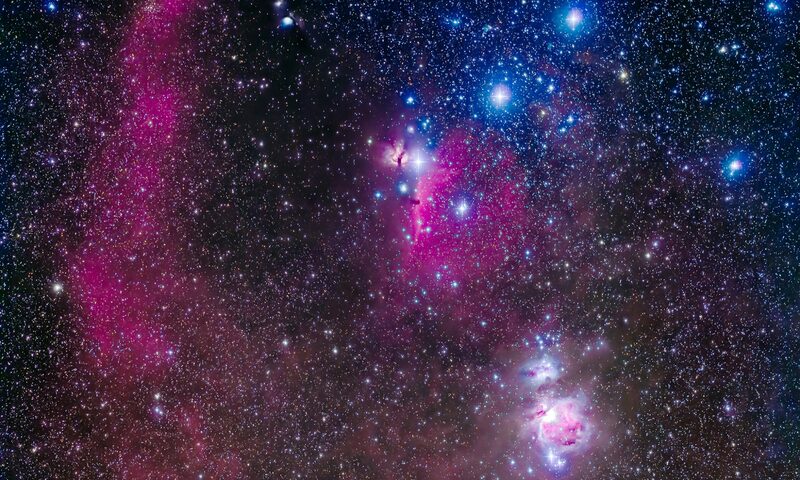 They are the half-sisters of the Hyades, another nearby cluster of stars in Taurus. Other stories describe the Pleiades as the Seven Doves that carried ambrosia to the infant Zeus. A seldom-used name now for this cluster is the Atlantides, from the plural form of Atlas, their father. Thus, these sisters gave their name to the Atlantic Ocean, a vast and uncharted sea until the 16th century. The term “atlas,” first used by Mercator for a book of maps, comes not from the Pleiades’ father but from a real-life king in Morocco who supposedly made one of the first celestial globes. I shot this portrait of the Sisters a few nights ago, stacking a set of five 15-minute exposures with the TMB 92mm refractor and Canon 5D MkII at ISO 800. I processed the image to bring out the faint clouds of dust that pervade the area. The Pleiades are passing through dust clouds in Taurus and lighting them up. The stars are embedded in dust, lit blue by the light of the hot stars. But even farther out you can see wisps of dust faintly illuminated by the light of the Pleiades. The stars are thought to be about 100 million years old, quite young as stars go. They formed together in a massive nebula that has long since dissipated, and will travel together for another few hundred million years until the sister stars go their own way around the Galaxy. The stellar family that gave rise to so many legends around the world will be scattered to the stars. The Pleiades is my favorite star group( cluster) .. I used to be able to see quite a few more than 7 with the naked eye especially if the skies were not washed out by city lights.. Alas, my vision is not as good as it once was so I am not sure how many I would see naked eye but they still remain my favorite..
My favourite, Allan. Thank you!